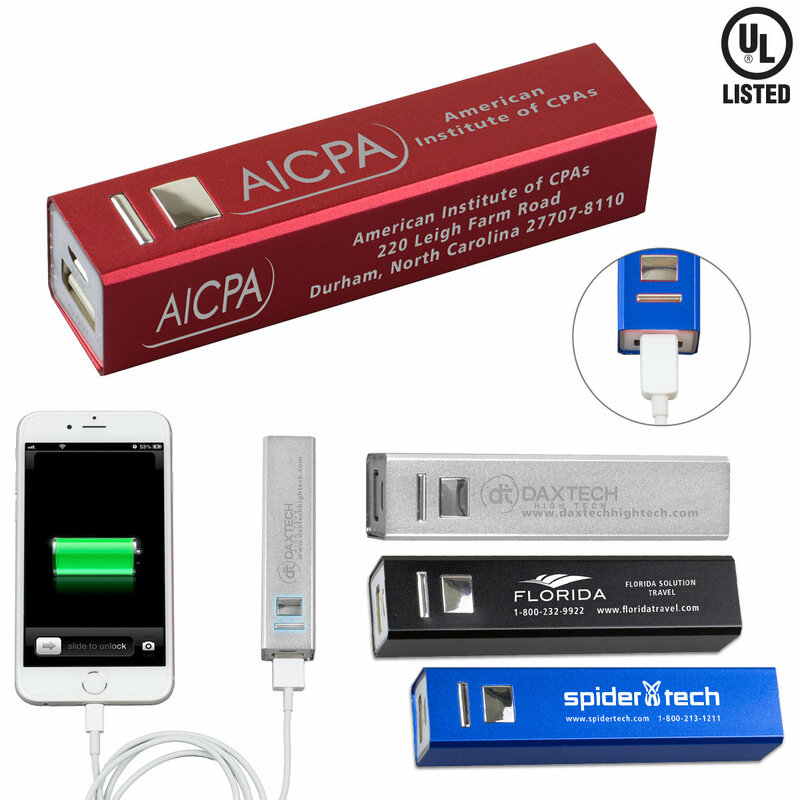 Aluminum alloy case (laser engraved) 2200 mAh Underwriters Laboratories (UL) Listed lithium ion Power Bank Charger recharges your cell and mobile phone battery when it’s running low. It recharges using a micro USB input cable (included), and it charges your cell phone through its USB output port using your phone’s own charging cable (not included). Guaranteed up to 500 charges. Output is 5 Volts/1 Amp; complete instructions included. International Shipments, Including HI & AK can only ship FedEx 2 Day or FedEx Overnight. A $40 charge per box fee will be added to shipping for appropriate documentation for hazardous materials. PB102 - Laser Engraving Setup Charge: 50.00 (G) per location. PB1024 - Photoimage 4 Color Setup Charge: 55.00 (G). Optional Backside Imprint: 3-1/2" W x 1/2" H.
PB102 - Laser Engraving - Price Includes: Laser engraving, one location. Additional Location: add .30 (G) running charge, plus setup charge. PB1024- Photoimage 4 Color - Price Includes: up to a 4 color process imprint. Digital Personalization: add 0.30 (G) running charge, plus setup charge.